Over 50% of all .onion sites down since Freedom Hosting owner got arrested. Category: Deep Web / Tags: no tag /	Comments Off on Over 50% of all .onion sites down since Freedom Hosting owner got arrested. On 5th august 2013 Eric Eoin Marques, founder of Freedom Hosting, which hosted over 50% of all hidden services got arrested by the FBI and NSA. Their motivation was clearly Tormails database, which contains thousands of email conversations between for example users of the Silk Road Marketplace, or more importantly maybe even communication between whistleblowers and journalists. Since the Hidden Wiki and OPVA, 2 of the largest remaining hidden services, are also down since yesterday, we suspect the FBI / NSA operation is still ongoing. You are welcome to leave a comment to this article if you got more information about the recent crackdown on Tor hidden services. Download and install the Tor browser from: https://www.torproject.org/. 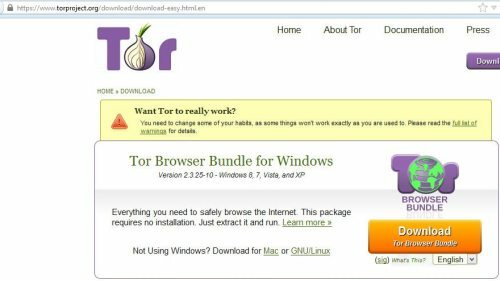 You will want to download the Tor Browser Bundle, as it is already set up and ready to go. The browser is available on different platforms and you can run it from anywhere; even a USB drive. This means you are also able to use “live” versions of operating systems if you wish, eliminating the traces that may otherwise be left due to spyware and other malware located on your computer. Bookmark TheHiddenWiki.org and the above sites so you can always have quick access to the Deep Web.